The Daily Jazz: Put that rhythm section down Wayne, you don't know where they've been. Put that rhythm section down Wayne, you don't know where they've been. Of course, Shorter knew exactly where messrs Tyner, Workman and Jones had been, and on his debut session as leader for Blue Note records, he wanted to pick a team that could follow him in his post-bop vision as far as he wanted to go. It would be safe to assume that John Coltrane's rhythm section could, by 1964, handle just about anything. Shorter is often thought of as one of Trane's successors, and this choice of sidemen goes a long way to confirming that, but his style here is all his own. While Coltrane's music was often dense, with notes squeezed in tightly, Shorter is more adept at using space in his compositions, and to good effect, too. 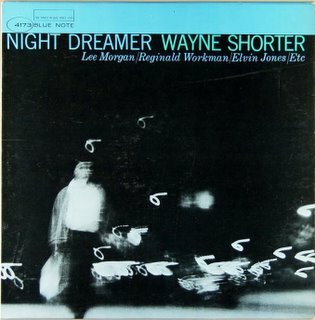 As a member of The Jazz Messengers, Shorter had become an important composer and respected tenor player, but it's not until these early Blue Note session sthat we see him moving on from the hard-bop style of that band to his distinctive style - which would become such a major feature in Miles Davis' mid to late 60s quintet. 'Brooding' can be defined as "pensiveness: persistent morbid meditation on a problem", and could have been coined to describe Shorter's music. Haunting, dark and very cleverly constructed, his use of atmospheric passages in addition to the more usual theme-solos-theme structure predated much of so-called 'post-bop'. Arguably he was the first significant jazz figure to move to this meditative style, which would be such an enormous influence on late 60s and beyond European jazz (think ECM). That Shorter was a man determined to present his vision is clear from the inclusion of take 14 of 'Virgo'. While most musicians of the time would record a handful of takes, there is no doubt that Shorter wanted to go over pieces repeatedly until he got exactly what he wanted. Things Have Got To Change!